As we waved goodbye to Venice from our “vaporetto”, we wondered if we would ever see her magical skyline again. For now, we were on to the next adventure and would soon arrive in the city of Pisa to visit another of Italy’s extraordinary landmarks! 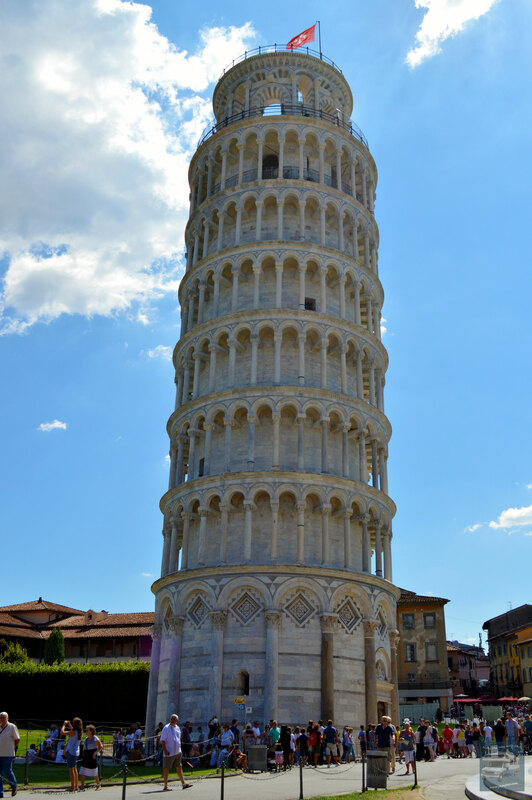 The Leaning Tower of Pisa is a campanile located in Campo dei Miracoli, “The Field of Miracles”. It’s one of several bell towers in Pisa but is the most famous due to its tilt. From the coach, we only had a short distance to walk before reaching the field and as we got closer, we were suddenly stunned by what lay before us. Not only was the tower magnificent, but the cathedral, baptistery, and cemetery made for an astonishing picture of Romanesque architecture. It was already quite hot and we sought shade while Ruth introduced us to our local guide Roberto, who enthusiastically shared his knowledge about the tower and the beautiful city of Pisa. Campo dei Miracoli truly was miraculous and if we’re fortunate enough to ever visit here again, we will most definitely spend more time exploring Pisa! Back on the coach, we relaxed while Domenico cruised on to Florence. We arrived at the ultra-modern Hotel Vittoria by mid-afternoon and had just enough time to freshen up before we were off again to Ristorante Montebuoni, nestled in the Tuscan hills. Our host for the evening, Chef Emelio, greeted us like we were family and we felt privileged to learn our group would have the entire restaurant to ourselves! Chef Emelio demonstrated how to make his spinach risotto from scratch while we shared wine, fresh bread, and good cheer. In addition to the risotto, a veritable feast of meats, pasta, and Italian desserts was served, and Chef Emelio even prepared a special veggie plate for me! On the way back to the hotel, we sang slightly buzzed versions of the Dean Martin songs playing on the coach and laughed out loud with our travel companions. A perfect end to another perfect day on the Road to Rome! After a whirlwind first day in Venice, we spent the next morning relaxing and shopping along the waterfront. 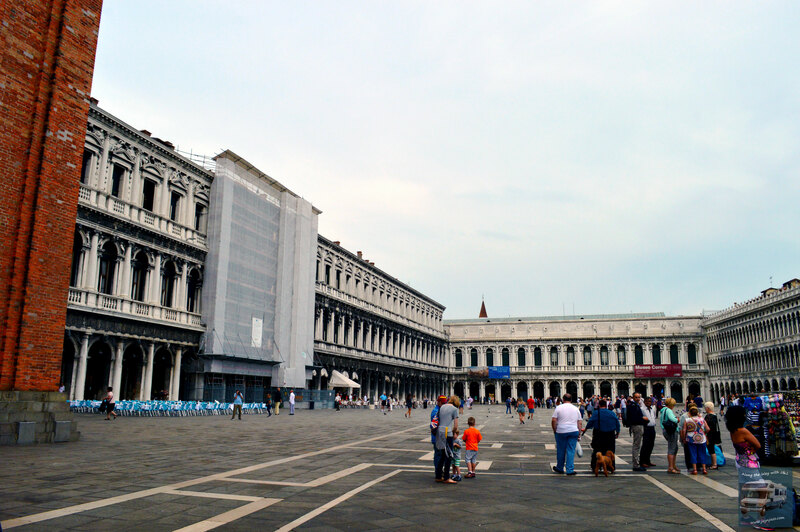 St Mark’s Square was fairly empty and we were able to snap a few good pics without a ton of tourists in them. Our first adventure of the day began at 11 a.m., when we boarded a private water taxi to the island of Murano for a glass blowing demonstration at B.F. Signoretti glass factory. A master glass blower took a glob of molten glass and transformed it into a unicorn before our eyes. We then toured parts of the factory and had an opportunity to purchase beautiful, one of a kind pieces to bring home with us. We returned briefly to our hotel to freshen up, then rejoined our new friends for a wonderful afternoon excursion to the picturesque island of Burano. There, we had a fabulous multi course lunch at the Trattoria da Romano. The wait staff pampered us with impeccable service, passing around dishes of Risotto, fresh seafood, pasta, and salad. Ruth also arranged for plenty of vegan options, and we completed our meal with a shot (or two!) of delicious Amaretto. 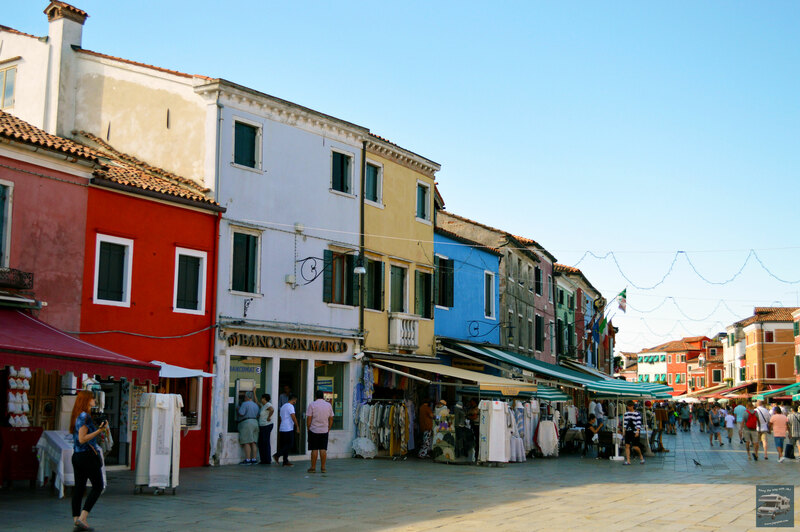 There was plenty of time for exploring after lunch, and we strolled lazily along the water, taking pictures of Burano’s famous candy colored houses. Generations ago, the fisherman of Burano painted all the houses bright colors so they could identify which was theirs through the fog after returning home from a busy day of fishing (and drinking). Burano is also known for its handmade lace and there were several local artisans displaying their unique pieces for sale. After a bit more shipping, we returned to the water to wait for our taxi. Once back at the hotel, we climbed to the roof top and silently watched as the sun covered the lagoon with a dazzling display of light before disappearing out of sight. Returning to the Bar Ristorante Bucintoro for a late dinner, we enjoyed authentic Italian pizza, wine and gelato. We now understood why Venice was referred to as “La Serenissima”. Join us on day 10 as we visit one of the most iconic landmarks in the world and shave a few more miles off the Road to Rome! Shortly after crossing the Italian border, we left Domenico and the coach behind and boarded our water taxi to “The Floating City”. We coasted along the Venetian Lagoon, taking in the sights and soon, Venice emerged in the distance, an amalgam of light and color. One again, Insight Vacations impressed us with their choice of accommodations. 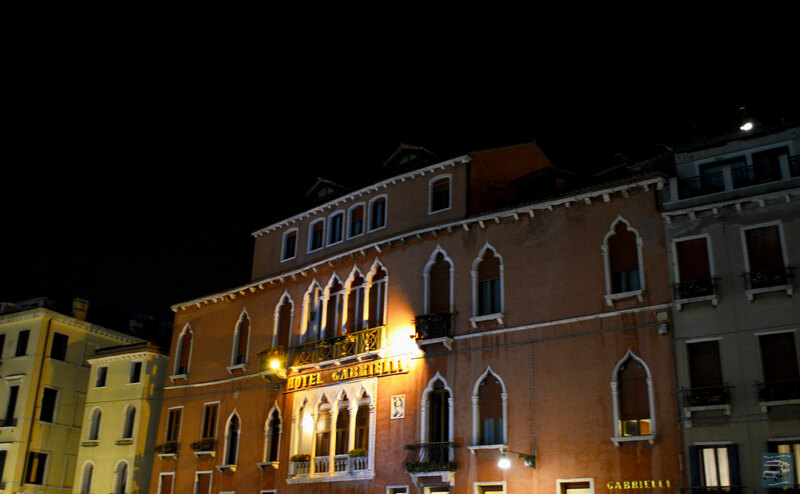 Hotel Gabrielli sits on the waterfront known as Riva degli Schiavoni and offers incredible views of the lagoon. The hotel is furnished in authentic Venetian style and we were charmed when the desk clerk gave us an actual key for our room! The room was spacious and comfortable, with a small balcony overlooking the inner courtyard below. After settling in, we met Ruth and the rest of our group for a short walking tour of the waterfront. 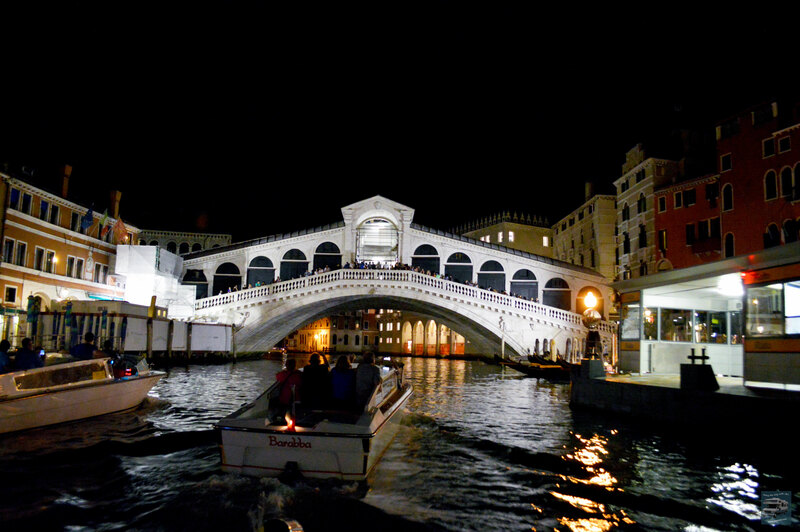 We marveled at the Bridge of Sighs, which is an integral part of Venetian folklore and the only covered bridge in Venice, and world-famous Piazza San Marco, also known as Saint Marks Square. 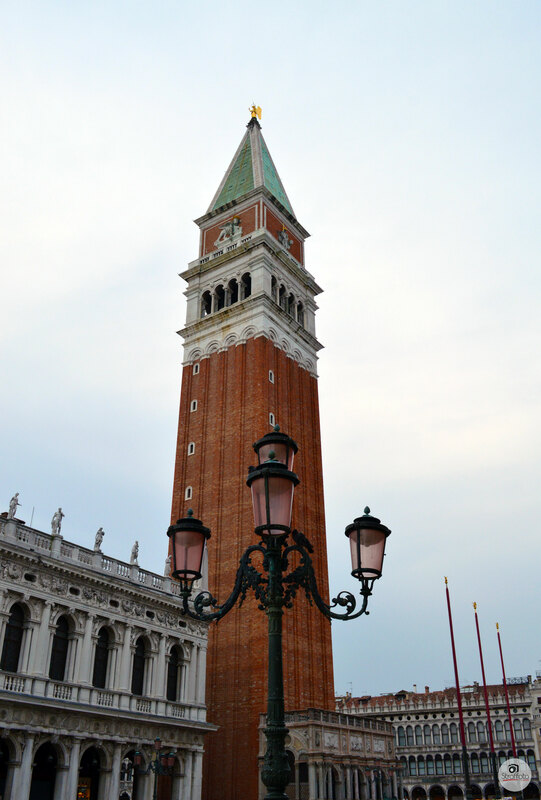 “La Piazza”, as its called by the locals, is home to Saint Mark’s Basillca and perhaps the most photographed landmark in Venice, Saint Mark’s Campanile. Everyone listened intently to Ruth’s history lesson about the area and then we followed her to a small dock, where several gondolas awaited to take us on a tour of the canals Venice is famous for. The gondolier carefully guided us onto our gondola and away we went. One gondola was occupied solely by musicians, who serenaded us with lovely Italian music for the duration of the trip. We later enjoyed a relaxing dinner at the Bar Ristorante Bucintoro right outside our hotel. Sunset over the lagoon was a spectacular sight and we were super excited for the evening excursion, a twilight cruise of the majestic Grand Canal via private water taxi! Venice’s Grand Canal is the largest and most populated canal in Venice. The canal is bordered on either side with buildings of various classical styles, which house everything from cafés and businesses to private residences. 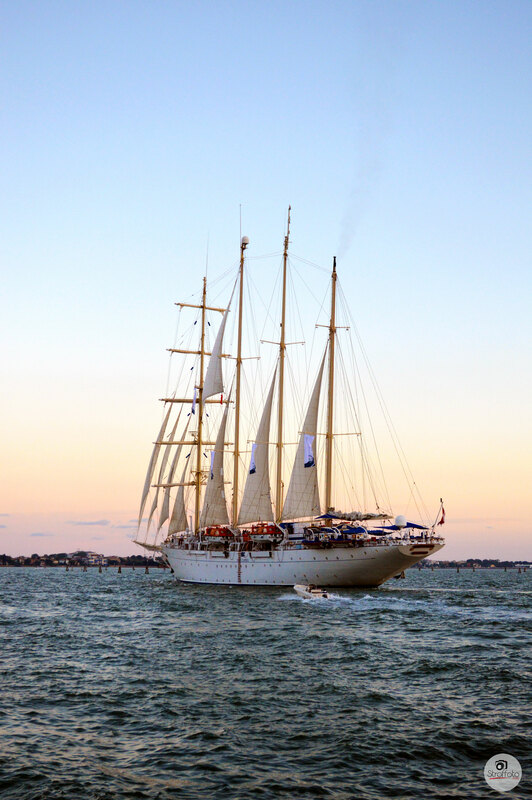 This is also where Venice hold its Historical Regatta, an annual boat race that draws thousands of spectators. The “grand finale” to this incredible experience was an invitation to the exclusive Café Florian in St. Mark’s Square. Considered to be the oldest café in Europe, Café Florian was the perfect place to conclude our evening. We indulged in their specialty drink, the Florian Spritz, and a dish of gelato while we watched a delightful quartet play both Italian and American music. Strolling back to our hotel, it was hard to imagine a more perfect day than this, but there was still many amazing adventures to be had on the Road to Rome. Check back soon to read about our second day in enchanting Venice! We hope you enjoy this short video of beautiful Lake Lucerne, Switzerland.